If the screw of a center axis is tightened, the surface of the rotation board becomes quite flat, and can be used as a usual, electric potter's wheel. It is possible to be used as a usual potter's wheel when the screws tightened in. 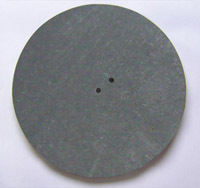 FP Wheel by which surface becomes flat tightening center axis without length. if a center axis is substituted short, and the sandpaper board is set, it is possible to use it as a grinder. 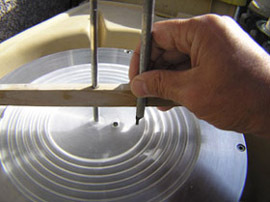 Install the plate with the sandpaper to a center axis. You can plane of gypsum, the acrylic fiber, and foot of the work　etc. You can do grinding that accuracy is high by installing a horizontal stick on a center axis. The blade and the metal can be plane by the superfine sandpapers. If you install the gypsum mass , you can process it to the shape for which you hope. The work making starts from the tool making. FP Wheel has a center axis, it becomes a mother machinel. Let's make some tools for the FP Wheel. 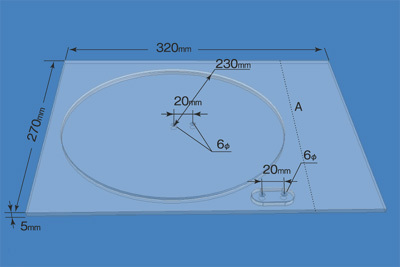 Prepare an acrylic board of 5mm thickness, and the disk of 230mm in the diameter is made from the material. It is because the size of the sandpaper sold well is 280×230mm. To ease work first of all, the board is cut in dotted line A. Make the hole of 6φ for the place where the straight line that connects the corner with the corner intersects. The hand drill is necessary. Make the hole of 6φ for a place 20mm away from the hole of 6φ. Fix the hole at the center of an acrylic disk into a center axis of the wheel, and fix another hole into the bolt of the rotation stop. 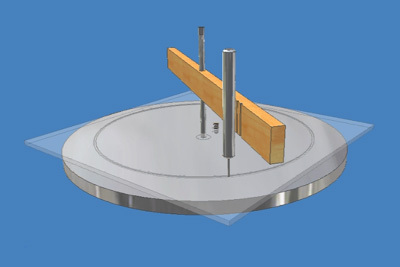 The disk can be cut out by rotating the wheel. Paste the sandpaper to the back and the table of disk. 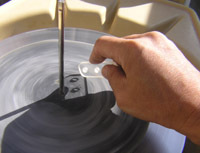 The disk with the groove used in the following process is produced in this method. Adjust the width of the groove to about 2mm. decide the position and the pitch of the groove freely. The thickness of an acrylic board might be about 8mm necessary. It is convenient to make JIG that suits two holes of a center axis and the stopper beforehand. A correct position can be punctured only in the place where it is allotted even if it doesn't separately measure it. An acrylic fiber transparent as the under is seen is convenient. If the disk that puts the sandpaper is installed, the corner where an acrylic board is sharpened is cut down and the so on can be cut down with the grinder. Be plane of the exchange blade of X-ACTO with the grinder, and make necessary shape. It is convenient that there is a cutter of an acrylic specialty, too. 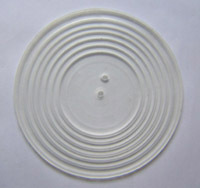 Spacer can be easily made by oneself like making a usual gypsum mold. First of all, design the spacer. The length of a standard center axis is 130mm. 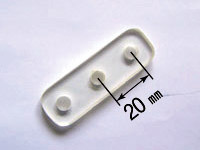 Because the part that goes out of the spacer up is 25mm when this spacer is put, the height of the spacer is about 105mm. The size of the spacer is decided by the size though it puts. In addition, it decides depending on the size of the groove . Prepare the throwing tool that installs the type board of a suitable size. Make the clay prototype like the left (local sectional view) from outer throwing tool. This is a part that becomes an internal cave. When the clay prototype is completed, casting board is fixed into the groove on this prototype outside. About 20mm might be necessary for the thickness of the bottom. It becomes heavy when thickening it too much. Measure a center axis that projects on the plate with groove, and put the sign on the place of 105mm with the clip. Cast gypsum around of the sign. Gypsum must stiffen while rotating the wheel. Remove casting board before gypsum　becoming hard, and cut down the part that becomes a bottom with a horizontal stick. Cut down a center part low. Reverse, and make the hole of the rotation stop by the drill.